Alexander Goldscheider has lovingly documented the entire musical career, in performances and pictures of Jiri Belohlavek, who died last week, aged 71. The intensity of his musical life is phenomenal: 10,074 performances of 1,680 works. See Sascha’s Facebook page for more. Impressive compilation. I’m surprised that the Czech Philharmonic is so high on the list, given that he was only director from about 1990-92 and then from 2012. I assumed he hadn’t been guest conducting them in-between, given the nature of his departure. But the headline is incorrect: 10,000+ works performed in about 3,000 concerts and 445 opera performances. 10,000 concerts would be 200/year over the last 50 years, a workrate that I don’t think even Gergiev maintains. Definitely a different list of works that you’d see with most other conductors – including 122 performances of Ma Vlast and a similar number for Martinu’s Symphony #6. Frankly, I wish the subject of Belohlavek’s passing would be dropped. He was most decidedly a frenetic conductor, constantly travelling among orchestras, and he must have conducted a singular number of concerts, whatever the precise figure. And so lurking in the background of this is the frequency of his absences from the BBCSO, for one, and the underprepared performances he gave when he was there. Yes, very much like Gergiev and as a consequence not a conductor to be mourned, much-missed, as were such as Barbirolli, Jochum, Giulini, et al. And after your passing we can all say crappy things about you with no chance of a rebuttal. I love people who are so unhappy with their own lives that they can’t resist taking cheap shots at others. Actually, I’ve written my own obituary. It begins, “This silly old fart finally kicked the bucket on….”. I long to read an honest obituary, but I finally decided I’d just have to do it myself. Hehhehhehhehheh!!! Your misinformed, inaccurate, insulting and disrespectful commentary seems to reflect a sad, bitter and twisted mind. Your obituary, I suspect, won’t arrive a moment too soon…. I think you better stick to writing your own obituary than callously slander one of the most hard working and noble maestros of the last half-a-century, who just tragically died. It was in January 1995 that Jiří first stepped into Maida Vale Studio 1 and into our lives. Initially he appeared a rather serious and unsmiling figure. We rehearsed Martinů’s cantata The Epic of Gilgamesh, seemingly endlessly repeating long sections. By the general rehearsal he was visibly pleased, his demeanour softened, complimenting players, and it is no surprise that the excellent concert went straight onto CD. I’ve seldom known a more hard-working conductor; he once said, “If you think I work the orchestra hard then how much more must I work myself?” Sitting close by the conductors as I usually do, I could see how well-thumbed most of his scores were. The last concert we performed with him, Dvořák’s beautiful Requiem, had a score that was practically falling apart and with many previous performances inscribed inside on the cover in his hand. He had also confessed to laziness in his youth, saying that he preferred ice hockey to cello practice [he trained first as a cellist]. But, by the age of 14, he had formed his first orchestra and begun conducting. He told me he even went on tour during his honeymoon with an all-female Czech orchestra! His charming wife Anna was nearly always with him when he came to London and has become a huge fan of the orchestra. We would see her on tour, sometimes at breakfast and she would always be happy to chat or thank people for their solos the night before. Little things maybe, but they make all the difference to an orchestra. There are so many memories: calling me into his room in the interval of a concert at the Barbican and asking (very nicely) if I could turn my pages less loudly; his peculiar brand of English, or “Czenglish” as he called it; all those wonderful concerts of Janáček operas, Martinů and Suk symphonies, and anything by Dvořák which he conducted with so much love and charm. I’ll never forget the care he lavished on a set of Slavonic Dances during one Prom season. He must have conducted them a hundred times but they shone like jewels. I seldom thank the conductor after the concerts but something moved me to do so after our last performance together. I asked Jiří when we would see him again and hoped he’d get well soon. That sadly was not to be, but I am incredibly grateful for all the hard work he put in and the lasting memories he gave us. Well, I do have a wee operation in the offing, Wray, so keep your fingers crossed. Quite minor, but anaesthesia can be deviliish…as also can the arts management business, but I hope your company is doing well in China. Jiří Bělohlávek was buried in a private ceremony in Prague today. Thousands and thousands poured in yesterday to pay their tribute to him at Rudolfinum, where he conducted nearly 400 most memorable concerts. I find it unfair and depressing that my own efforts to statistically document his unique career seem to be derailed here by a disrespectful, dishonourable and completely unfounded singular comment and I would suggest to move away from it and start properly appreciating the legacy of a true maestro! I’m sure he was at the BBCSO as much as his contract required. If they wanted more, they could have negotiated it. Was he there any less than his predecessors? And just how much does the BBCSO play in a year? Like the other London bands, they’re doing one-offs, so if he conducted 10-12 times in a year at the Barbican and RAH (plus some tours and run-outs), that’s a pretty normal season. Anyway, he appears to have been much beloved in his hometown of Prague, where he made a lot of great music with some great orchestras. 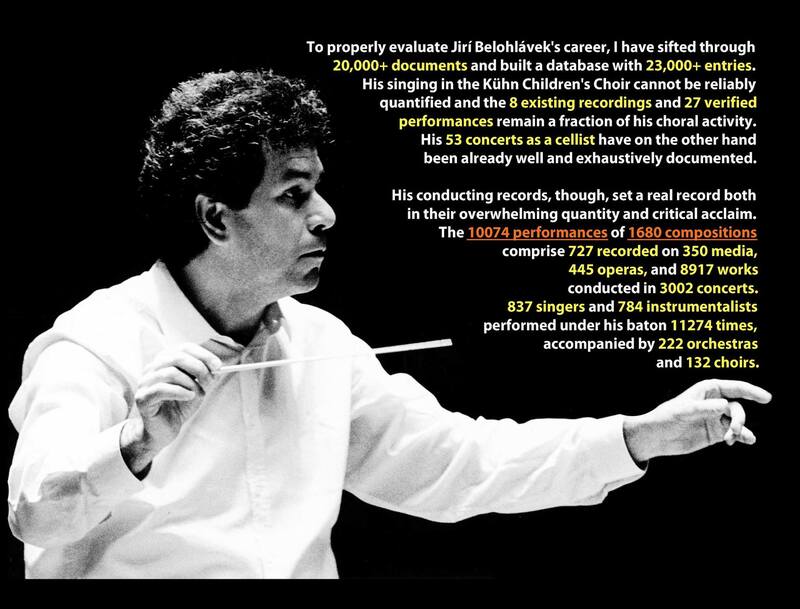 Jiří Bělohlávek conducted the BBC SO in 215 concerts and recordings in 28/01/1995-13/04/2017. During his tenure at the BBC in 2006-2012, he conducted 156 concerts and recordings, including three Last Nights of the PROMS. He was awarded an honorary CBE for services to music, above all for his work at the BBC. What an extraordinarily unpleasant comment. You evidently dislike the late Jiří Bělohlávek intensely, ostensibly because you think that he was a poor conductor who did not spend enough time working with the BBCSO. If those really are your reasons your reaction to mourning for his death seems rather disproportionate. In general, I do not subscribe to the view that one should never speak ill of the dead, but, equally, it seems extremely distasteful to be gratuitously unpleasant about somebody recently dead who was otherwise greatly liked and admired. Bitter it certainly is that Belohlavek had the career, not you. And now he has thoughtlessly died without ever recognizing your distemper. Poor slob, is there NO justice? Steven H — if you could please provide us with a list of conductors we ought to admire, I’m sure we would all be duly grateful. Thank you so much. The question is how can we access the full database. Going to the Facebook page we see a bunch of pictures with some interesting information. But we don’t even have the full list of the composers from Belohlavek’s repertoire – though the pictures do show which music he has conducted most often. At least we can have the complete list of the composers from maestro’s Belohlavek’s repertoire. That should only add a few more photos. I would appreciate if you could do so. Like Don Ciccio, I would like to know how one might access the full database, since this information looks fascinating. I don’t do Facebook or Twitter, so I would welcome a direct internet link, if that were possible. While Stephen Holloway is perfectly free to express his opinion, that does not prevent me from finding it both repulsive and wrong. If he would care to quote chapter and verse using the Boosey & Hawkes scores, I would like to know exactly where, on the great Onyx set of the Martinů symphonies recorded live at concerts given in the Barbican, all of which I attended, there is evidence of ‘underprepared performances’. The performances of these hugely demanding and complex scores (just look at the music) were revelatory in their precision and structure. If one takes a look at the comments by, among others, Phil Hall, viola in the BBCSO, on The Arts Desk’s tribute to Bělohlávek, you will see clearly how demanding his expectations were. They put the lie to Holloway’s vile insults to the memory a great conductor.